President Barack Obama will host some 120 African youth leaders from 40 African nations in Washington next week, part of a commemoration of 50 years of independence for 17 countries. The President's Forum is intended "to deepen and broaden our understanding of the trajectories of African societies, and to reflect on how the next generation are building their communities' and their nations' futures – just as their predecessors did in the era of independence from colonial rule," the White House said in a statement. Representatives from civil society and the private sector will participate in a town hall meeting with the President and a series of workshops at the State Department on a range of issues, including transparency and accountability, job creation and entrepreneurship, rights advocacy, and the use of technology to empower individuals and communities. The Obama administration is also hosting the annual United States-Sub-Saharan Africa Trade and Economic Cooperation Forum, which was established by the African Growth and Opportunity (Agoa) Act passed in 2000 to promote economic ties with the continent. 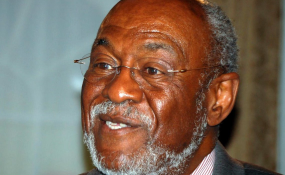 In part three of an AllAfrica interview, Assistant Secretary of State for Africa Johnnie Carson, discusses the administration's policy priorities. What do you hope will come from the Agoa forum and related meetings? We've got the first two days of the forum in Washington DC, with the participation of Secretary of State Hillary Clinton and several other Cabinet-level officials. Then moving for the first time outside of Washington to Kansas City, where we hope that a number of participants, both from the government and the private sector, will have the opportunity to see for themselves the vitality of America's agro-industry sector, and how, if it's developed in their own countries, could help them end food deficiencies and build substantial agro-industry. It will be an opportunity for them to meet business leaders in the agro-industry - producers, processors, and marketers of food, agricultural companies that develop fertilizer and specialized seeds; that it'll give them an opportunity to visit both small and large - but successful - farms of all kinds. To meet with the manufacturers of specialized farming equipment. To be able to look at and perhaps find individuals who are willing to make investments in Africa's agriculture sector. To find partners with African governments and private sector individuals to grow their agricultural sector, to make it more meaningful economically for their people at home. To develop products that can be used to come into the U.S. market under the Agoa system. This could be anything from specialized leather products - belts, shoes -to perhaps agricultural products that we only produce in this country on a seasonal basis, or perhaps producing products such as yellow roses, carnations, and other things that are in heavy demand and low productivity in the U.S. on a normal year-round basis. There are lots of opportunities out there and we hope that this will interest American companies in Africa. How is this decade-old legislation relevant to today's conditions? It is my hope that we can build on Agoa. After ten years, Agoa needs to move into new directions that will ensure its vitality and importance for the next decade. There are lots of new ideas out there for how to strengthen Agoa, and we hope to be able to talk about some of those while here in Washington. But I also hope that every future Agoa forum will include not only meetings in Washington with government officials, but also will offer an opportunity for African trade ministers, finance ministers, and industrial ministers to go out into the heartland of America, to make connections that will make American business more familiar with Africa, African goods, products, people and officials, and also help African businessmen and government officials learn what's happening in the United States and how they can make their products more acceptable to an American market. We're committed to Agoa, and we want to make it a success. We cannot live on Agoa's past; for Agoa to remain important, we have to help build it up for the future. What must African governments do to make themselves more attractive to American investors? Liberia, for example, has made an impressive number of investment deals with a range of companies and countries. Can that be replicated in other countries in Africa? Absolutely. It is happening. Africa is doing many things, many of which probably would have had a greater pace if we had not had a worldwide recession. Africa needs to do what the states in East Africa have done. The East African Community took the dramatic step of reducing its trade barriers and now is allowing greater movement of people and goods across the borders. That's important - creating larger markets that are not impeded by customs and tariffs; by long waits at border crossings; by both formal and informal tariff barriers; by national jealousies that make it difficult for investors to be able to move their products to another country. These sorts of things help not only the country where the factory is located. It in fact helps everybody who makes a box to put that product in, who prints the product labels, who moves the product across borders, the sub-supplier in the country who sells the product - who gets a profit off being able to sell to somebody else. One of the other things that have to be done is a systematic effort at reducing the impediments to establishing businesses, reducing the impediments that foreign and domestic investors have in creating businesses, reducing the red tape and creating a business and commercial-friendly environment. Third, they have to make sure that the legal and regulatory framework protects the investor, protects the person who's going into business. They need to know that if there's a problem it will be handled transparently by the courts, and not in the back office of a minister or a fixer. Fourth, [African governments] have to do a better job of corralling, controlling, and eliminating corruption - corruption is a major impediment to business development. And equally, there has to be an improvement in infrastructure - roads and ports - to cut down the time it takes to move things from a port to a major city, or from one major city to another internally, or across the border. Africa is not a stagnant place; there are lots of people doing very, very good things - who are aware of the challenges that are in front of them, the impediments they have to deal with - but are facing those challenges and making progress because they recognize that this part of the world probably is the last great under-attended-to economic zone. The potential is enormous. There are countries out there that have tremendous potential, and over the next decade and a half, we will see it. I think that we will see enormous growth in places like Angola, Ghana, Congo-Brazzaville, Tanzania, Malawi, Namibia, Botswana. I think that we will continue to see South Africa as a tremendously bright and shining star that says to Africa what President Obama said to America two years ago: "Yes we can." What in your view is most needed for the continent to overcome its legacy of exploitation and poverty? Primarily, we believe Africa has enormous potential and promise that has yet to be realized. But we believe this potential and promise can only come about as a result of strengthening democratic institutions which allow people to participate in the governance of their country and to live lives free from authoritarian control, and which allow them to have dreams and opportunities. We also believe that Africa can only realize that potential and promise by continuing along the path of sustained economic reform, economic growth, and expanding commercial and business opportunity. These things are absolutely essential, and it's why we put a lot of emphasis and focus on them. On the political side - we've been pleased by the progress towards democratic rule in Guinea-Conakry and we want to see the runoff elections go well. We have to applaud General Konate for taking his country away from the brink of serious human rights violations and leading to where we've gotten right now. We hope that the runoff between Alpha Conde and Mr. [Cellou] Diallo will go well. We've seen a commitment on the part of the military junta in Niger, where we were among the very first to recognize and criticize an unconstitutional exercise of power. We're glad to see the government there announcing its commitment to a return to democracy in the next six months, with elections in the early part of January 2011. We'd like to see more progress on Madagascar. It is absolutely imperative that the key leaders recognize that the interests of Malagasy citizens are far more important than their own personal interests. We continue to work with the AU, with [former Mozambican] President Chissano, on this effort. We've been working on Zimbabwe, particularly most recently on issues related to the Kimberley process, and that's very important for us as well. What is your answer to those who say this administration less engaged in Africa than they had hoped or expected? Let me say that this administration is actively engaged across the continent. Following the Secretary's trip to Africa a year ago in August, we've established bi-national commissions with South Africa, Nigeria and Angola. In each of these countries, we now have working groups that are focusing on various aspects of this. The South Africa-U.S. relationship is vibrant and strong, and Secretary Clinton has worked hard to establish a positive relationship with her counterpart in South Africa. We've worked hard on the relationship with Nigeria, and we are very pleased that Nigeria has come through a very difficult moment – where President Yar'Adua's sudden death after a prolonged illness did not lead to instability, did not lead to an extralegal transfer of power, did not lead to a military coup d'etat. We worked to help foster this, and we thank Nigerians in and outside government and in uniform for making this happen. We've established these partnerships, and we hope these are going to be central in helping to build stronger relationship, stronger partnerships. Let me also say that President Obama, after the visit to Ghana early in his administration, has seen a number of African leaders, including the leaders of South Africa and Nigeria. We've had visits to Africa by the Secretary of State, the vice president, the deputy secretary and the under secretary of State for political affairs, and others. Looking ahead, what are the issues that cause you greatest concern, that make you worry? We've touched on Somalia, the referendum in Sudan and Darfur. There is continued violence and uncertainty in eastern Congo and continuing, worrying signs of violent extremism in several parts of Africa. And there is the rise, regrettably, of narco-trafficking, not only in west Africa, where it gets a lot of attention, but in parts of east and southern Africa as well. Too many drugs are flowing through the port of Mombasa and through the port of Maputo. Too many drugs are finding their way through airports such as Nairobi and Addis Ababa. Drug issues in South Africa are of concern as well. Because of the need to address so many other problems, governments have not taken this problem as seriously as they should. But by not dealing with it, they will be hurt by it.